I love how every fantasy or science fiction show on TV lately is a long game of 'Spot the Vancouver landmark'. 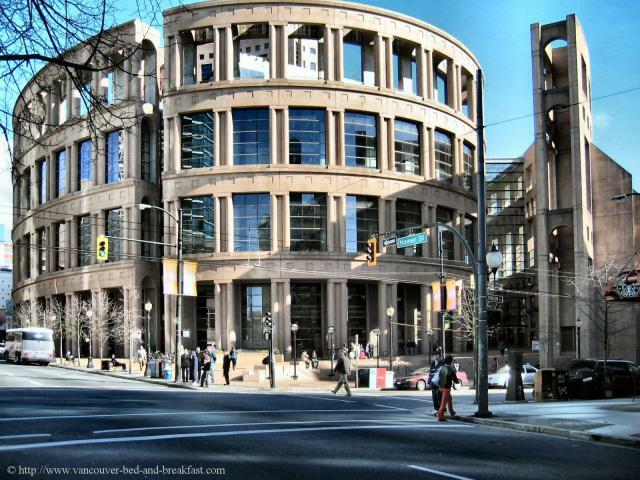 No that isn't the headquarters of alternate dimension Fringe Division, it's the downtown Vancouver Public Library. It's futuristic, neoclassical coliseum look has naturally, also been glimpsed in Battlestar Galactica and Caprica helping make that Greco-Roman mytho link of the stories part of the visual tone of the shows. 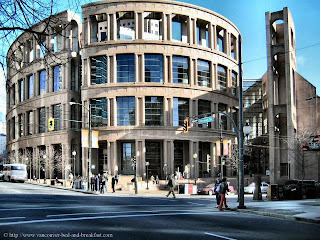 Other examples of the glassy modernistic architecture of Vancouver like the UBC Museum of Anthropology also appear regularly. Lots of back alleys, stretches of lonely highway and beachfront broodiness in Supernatural are familiar to anyone who's ever spent any time on the lower mainland - and just the constant gray sky light and unrelenting rain in recent episodes of Caprica and whole seasons of the X Files are pure British Columbia. It's enough to get all misty for the town I grew up in.